So, traffic has been pretty good on this blog of mine. I thought the word was getting out pretty well. I was up to about 100-200 hits everyday, which I thought was pretty damn good for a blog just started 2-3 weeks ago. 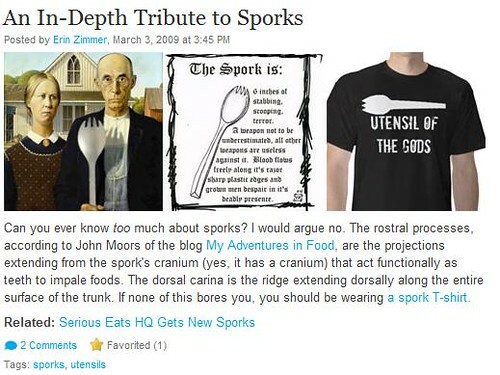 I was featured by Seriouseats.com last night for my tribute to sporks post from yesterday. I thought this was pretty cool since Serious Eats is one of the bigger food blogs on the internet, plus one I read regularly. Then this morning, I found that I was also linked on Gorillamask.net, which is the last place I ever thought I would get a link for a food blog. If you’ve never been, take a look. It’s an interesting site. So i’m thinking, Wow.. this should really help the traffic to my site. What did happen… from midnight until right now (7:25PM), 3,307 different people have visited this blog, making it the 40th most popular blog on Word Press. I thought this week was going to be slow because of my heavy work load and school schedule. I guess not. I guess what I’m trying to say is, I hope you enjoy this thing I have put together. All 3,307 of you.. But most of all, I hope whoever the 1 single person who visited the site was on February 8th is enjoying it as well. Because you, my friend, are an O.G. Just a straight original gangster. As of this morning I am the #18 most popular blog on WordPress, with over 5,000 views in the last 24 hours. That is crazy. « Arizona Iced Tea – Addictive?